Here are 7 free websites to extract images from PDF. A PDF can contain multiple images and when you want to grab all those images, these PDF image extractor will be helpful to you. All you need to do is add PDF from your desktop and the website (you’re using) will process the PDF to extract its images. After that, you can store all the output images to PC with a single click. I won’t say these sites will give 100% result but the satisfactory result can come surely. Some of these sites also come with the feature to login to your Dropbox or Google Drive account so that you can add input PDF and extract the images. A few sites also let you set the output format such as JPG, BMP, PNG, TIFF, etc., to extract images from PDF. Moreover, a few unique features like extract font from PDF, extract text from PDF, attachments are also present. 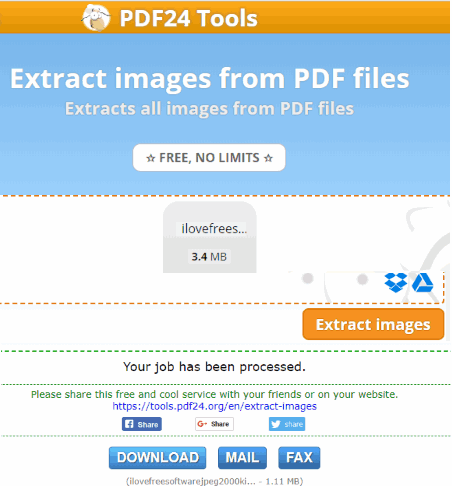 Let’s check these free PDF image extractor websites one by one. PDF Candy is a handy website where extracting images from PDF is just a matter of few mouse clicks. You can add a single PDF from Dropbox, your Google Drive account, or PC. The size limit for input PDF is not mentioned so I’m not sure it can handle PDF with 100MBs. Once the PDF is uploaded and processed, you can get the download link of PDF images. All images of PDF files are downloaded in a zip file. You also have the option to save extracted images to Google Drive or Dropbox. Your input PDF and output images extracted from PDF remain on its server for as long as 1 hour and then deleted automatically. PDF24 has features similar to PDF Candy. You can add PDF from Dropbox, PC, or Google Drive and then it will upload and process that PDF to extract images. I wasn’t able to find output maximum size limit for PDF. Perhaps there is no limit so you can try uploading large PDF to extract its images. Once the job is done, you can get all the PDF images in a zip file and download it to PC. Or else, you can also request to send email to receive the zip archive containing all the PDF images. All the input and output data related to your PDF file is erased after a short period of time. The website is quite useful and can be given a try. PDFaid is a good competitor to rest of the online PDF image extractor websites. The benefit of this website is it gives different formats to save PDF images. While the PNG image format is recommended for extraction, you can also choose image format as JPG, BMP, or GIF. To extract images from PDF online, the process is very simple. Upload a PDF with maximum 20 MB size and then select the output format. 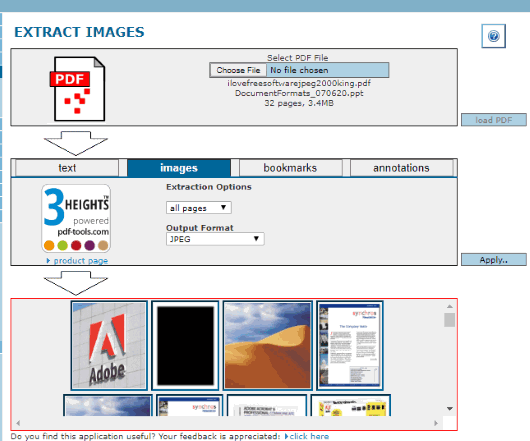 After that, you can use “EXTRACT IMAGES” button and then it will process the input PDF. After a few seconds, it will provide the link to save PDF images to PC in a zip archive. If you have some PDF larger than 20 MB, then you may also contact the website owner and he/she might help you extract images from that large PDF. Your PDF document and the extracted images are saved for only 48 hours and then it will remove all the data from the website. ExtractPDF.com is one of my favorite websites on this list. I first used it to extract fonts from PDF because I didn’t find any better online tool for that. Then I found that it is also helpful to extract images from PDF. You can upload a 14 MB PDF file and then it will automatically do the image extraction process. Once it is done, you can see thumbnails of all images. Clicking on a particular thumbnail will help you download that image to your PC. If you don’t want to download images one by one, then simply use “Download all images as zip file” button. This will save all the images to your PC in the folder of your choice. As I mentioned in starting, the website is also pretty useful to extract PDF font(s). Apart from that, you can also extract text and PDF metadata. So, it is a multipurpose website that you can try. Your input and output data remains for half an hour only and then the website will delete everything. iLovePDF is a pretty helpful website to extract images from PDF. Like “PDF24” and “PDF Candy”, it also supports option to add PDF from Google Drive account, Dropbox, and PC. The output images can also be saved to any of these three platforms. 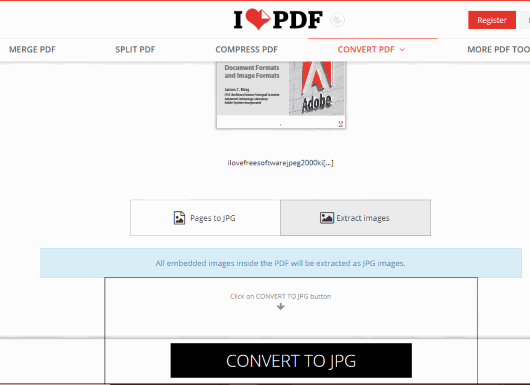 Apart from that, you also have the option to convert all PDF pages to JPG images. You can use this website with a free account or without an account. If you’re using this website without any account, then you can upload a maximum 20 MB PDF file. You can increase this limit to 25 MB by creating a free account. There are many other features that you can use. For example, you can compress PDF, merge PDF, add page numbers to PDF, etc. Your processed and input PDFs are also removed within 24 hours. So you don’t have to worry about what will happen to your data. PDF-online.com is also a nice option to extract images from PDF. There are 3 basic steps that you need to follow to grab images from the input PDF and then save the output images. Add PDF from PC and it will show the total number of pages in that PDF. After that, you need to load the PDF and then select “images” tab. Now you can select if you want to extract images from all the pages or only a specific page. You can also set if you want to save images in TIFF or JPG format. Set options and then finally you can see thumbnails of all the images present in that PDF. That’s it! Now you can tap on an image and then save as window will open to store that image to a folder of your choice. In addition to extracting images from the PDF, this website is also helpful to extract PDF text, bookmarks, and annotations. The features are quite useful but there are a few points to consider. You need to create a free account to use this website. You can’t download all the images at a time. You need to click on an image, save it, and do the same process again. This won’t be so useful when there are hundreds of images in a PDF. Also, I wasn’t able to find if the website stores your input PDF and output images on the server forever or deletes them after some hours. PDFdu.com is good enough to extract images from PDF with two to three mouse clicks. Here, the good thing is you can set the output format for images to PNG, GIF, JPG, or BMP. 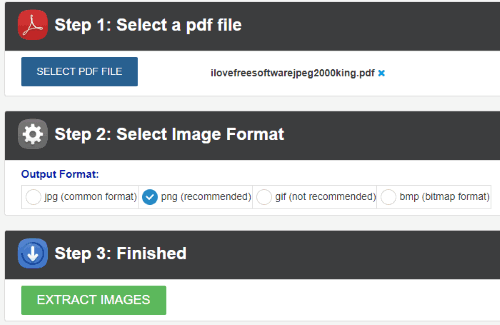 While many other sites support only JPG or PNG format to extract PDF images, this website gives multiple image format options. The input PDF size limit is not mentioned so you need to check this yourself. It removes the uploaded files after two weeks. Based on these features, it can be given a try. But, the point that you won’t like is it doesn’t let you save all extracted images at a time. You need to click on an image which is opened in a separate tab. After that, you can save the image to PC using right-click menu. 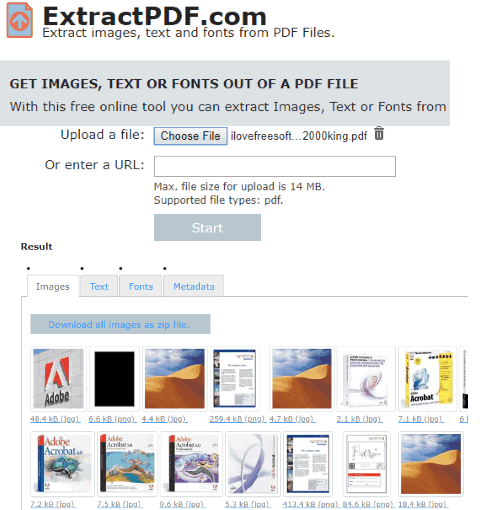 If you don’t like it, then you may try other PDF image extractors covered on this list. Otherwise, the website is a nice option. All these serve the purpose to extract images from PDF online very well. But, my favorite are “PDF Candy” and “ExtractPDF.com” websites. Both are pretty simple and have different interesting features like extract font from PDF, upload PDF from Google Drive, etc. These requirements fit my needs. You may try all of these websites and then decide which one will be best for you.